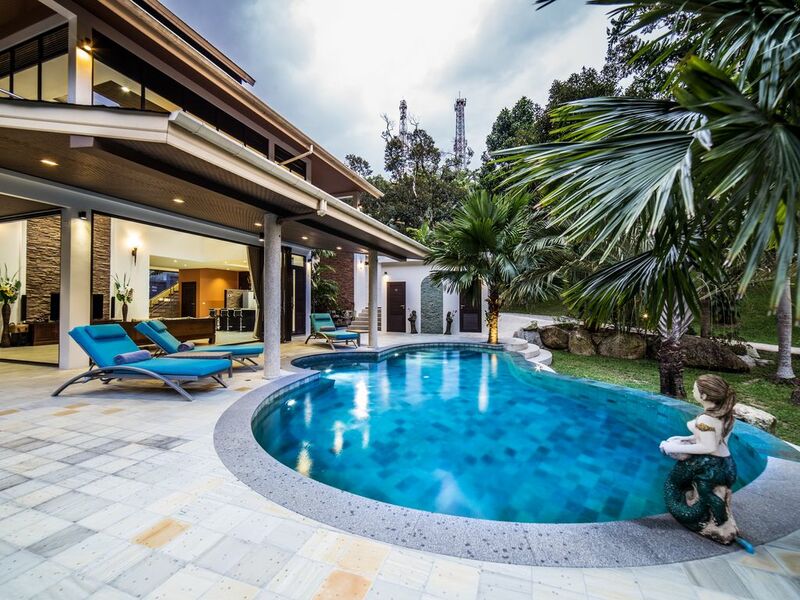 The Villa is located only minutes away from the gorgeous Nai Yang and Nai Thon beaches, surrounded by scenic mountains and close to Phuket's International Airport. The villa's quiet niche is an ideal setting for a relaxing holiday. This private tropical 2 bedroom villa has a fine feature superior amenities. Some of the features you will enjoy are splendid lush garden consisting of primal huge trees, natural water ponds, oval-shaped private pool based on salt-water system with Jacuzzi, high vaulted ceiling living room and sliding glass doors/walls which provide a feeling of spaciousness, where the tropical garden and pool area become integral to the living space. For the comfort and convenience of guests, you will have a daily/every second day housekeeping, the fully-equipped western style open-plan dining and kitchen area, and the laundry room with a proper one-button system washing machine. The atmosphere around the villa is cozy and relaxing, with a harmonic sense of space, blending nature and art in a tranquil setting. Our lovely three dogs become a special part of our villa who are always around, keeping you company that you would never get bored of. They are well educated with good behavior and living only at the outdoor area. This is a great place for those who are seeking somewhere to relax, recover, unwind and recharge their batteries. Although it would be our pleasure to welcome all guests to stay with us, we would unfortunately not recommend to the guests with children under the age of 6, due to the safety reasons. The landscape and design of the house are not considered as appropriate for small children. The first bedroom on the upper level with en-suite bathrooms has a private balcony facing towards the mountain, allowing you to enjoy sleeping next to nature and waking up via natural sounds.